Years from now, historians will argue over whether this was a jump—constrained, as jumps are, by the laws of physics—or something else entirely. The good news: After teleporting from north to south island, he stuck the landing. The bad news: The devil-jump warped Nillaaa to a spot near the bridge, which is usually overrun with vicious campers. However, despite being rattled by the sheer strangeness of his near-death experience, he managed to pick off a dude, grab a car, and speed to safety. He went on to survive a handful of harrowingly up-close skirmishes, kill ten people, and win the match. 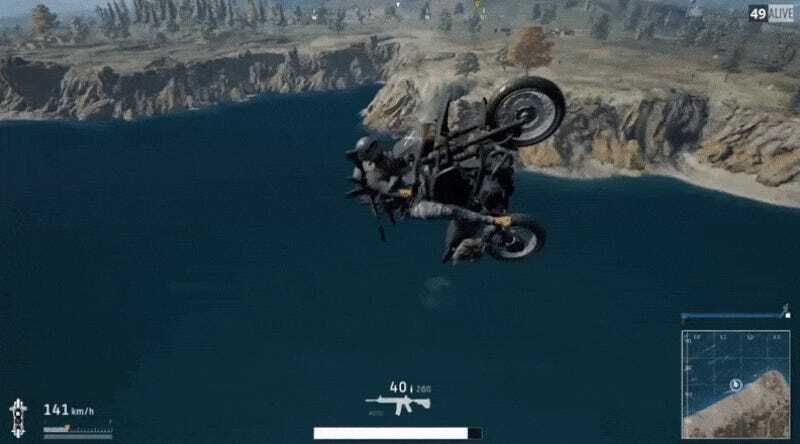 In any given game of PUBG, most players wouldn’t have survived the bike ride outside space-time or any of those individual encounters, let alone all of them. Those historians I mentioned earlier? Yeah, they’re gonna be really confused.